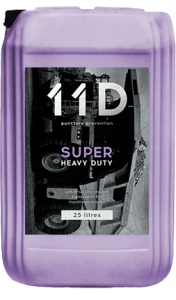 11D Super Heavy Duty Tyre Sealant uses the patented Poly Pearl® technology and is designed for Heavy Duty off road operations and allows protection against the largest punctures, often used by heavy duty vehicles operating in remote locations. By using 11-D, 95% of all common tyre failures can be prevented. Using the pattented Poly Pearl® technology, 11D Super Heavy Duty tyre sealant offers protection against large punctures in the thread area of the tyre – preventing costly downtime and improving the efficiency of both the vehicle in which it is used and the operation of which it is a part of. 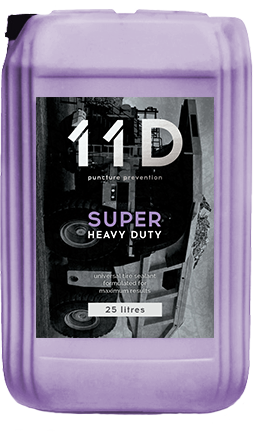 11D Super Heavy Duty offers continuous protection against tyre punctures and once applied, it will last the whole tyre life. Both Non Toxic and Nonflammable, 11D Super Heavy Duty is a worry free solution which is easily applied and removed. When the tyre is changed, 11D Super Heavy Duty is removed with water. 11D Heavy Duty is fitted with the patented Poly Pearl® technology, an innovative solution which improves fixation, sealing ability and durability of the seal. 11D Heavy Dity makes any tyre into a self-sealing tyre. By eliminating 85-95% of flat tyres due to punctures in the thread area of a tyre, it will dramatically improve the operability of any heavy duty vehicle.